KANSAS CITY, Mo. 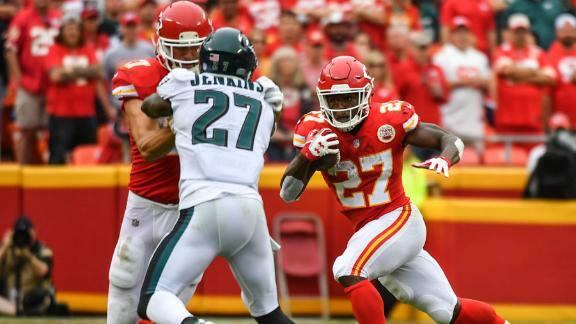 -- Chiefs rookie Kareem Hunt reached the end zone twice, Travis Kelce took a shovel pass 15 yards for the go-ahead touchdown and Kansas City held on to beat the Philadelphia Eagles 27-20 on Sunday. Kelce's touchdown catch with 6:25 left and Hunt's second TD scamper appeared to have put the game away. Kelce finished with 103 yards through the air, highlighted by his somersaulting score. Hunt had 81 yards on the ground, building on a record-setting debut in which he piled up 246 yards from scrimmage in a season-opening victory in New England. It was 13-all in the fourth quarter and Philadelphia had the ball when Wentz threw a pass that bounced off the Chiefs' Justin Houston and into the arms of Chris Jones. The pick gave Kansas City the ball deep in Eagles territory, and Kelce hurdled into the end zone five plays later. The Chiefs' defense, missing star safety Eric Berry to a season-ending injury, kept the Eagles in check most of the game - and for good reason. They're coached by Doug Pederson , who spent several years as the offensive coordinator in Kansas City and took the same system with him to Philadelphia. JONES-ING: Along with his interception, Jones also piled up three sacks in a dominant performance for the second-year pro. The Chiefs' defensive tackle even left briefly in the second half and appeared to be checked for a concussion before returning to the field. CLIPPED WINGS: The Eagles' ailing secondary lost two more players when starting safety Rodney McLeod and backup cornerback Jaylen Watkins left with hamstring injuries in the first half. Philadelphia was already without starting cornerback Ronald Darby because of a dislocated ankle.